SINGAPORE – The Government announced tweaks to property cooling measures on Friday (March 10). 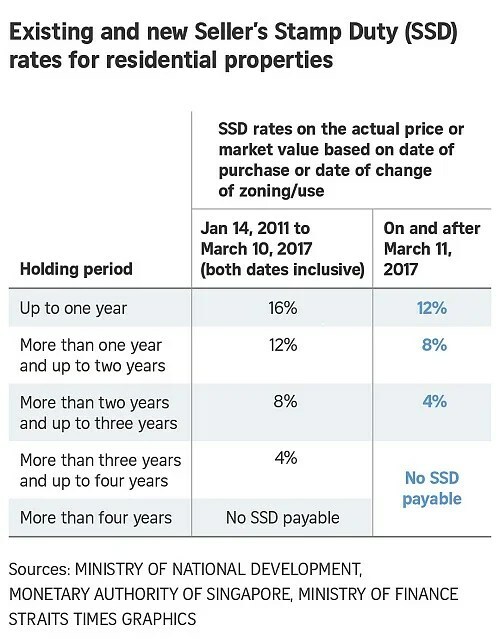 With effect from Saturday (March 11), changes to the Seller’s Stamp Duty (SSD) and Total Debt Servicing Ratio (TDSR) framework will take effect, but current rules on Additional Buyer’s Stamp Duty and the general loan-to-value (LTV) limits will stay the same. Not sure what all this means? Read our quick explainer below. What’s the change: There is no change to the 60 per cent threshold, but it will no longer apply to mortgage equity withdrawal loans with loan-to-value ratios of 50 per cent and below. What’s the change: The following changes apply only to homes bought on or after March 11, 2017. For example, currently, the seller of a property held for for one year or less will have to pay 16 per cent in SSD. With the change, this will be lowered to 12 per cent. A seller of a house held for three years ago or less will pay 4 per cent, down from 8 per cent.